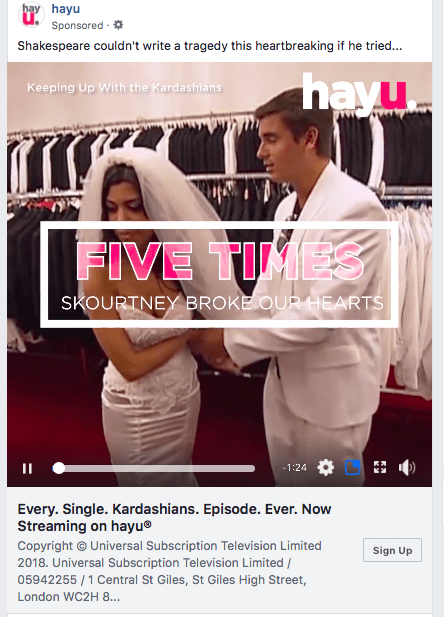 Are you currently using Facebook ads, but not seeing any results? Even though Facebook has over 1.4 billion daily active users, it’s impossible to make them all convert and create sales for your business. After all, people aren’t always online at the same time and, even if they were, it’s pretty unlikely that everybody will be interested in what you’re selling. If your ads aren’t performing as well as you’d like, don’t despair. There are proven ways that can help turn them around, and generate new awareness, fans, subscribers, and—ultimately—customers. There’s no point in creating a Facebook ad if it’s not going to catch anyone’s attention. According to ConversionXL, it takes just 2.6 seconds for a user’s eye to decide where to focus on a webpage. And if you utilize eye-catching imagery? Well, users are more likely to be drawn to your ad. Basically, visual design is everything. First and foremost, use clear, bright images—or GIFs and videos for a more interactive option—that can capture and sustain your audience’s attention. Also, consider size as a key aspect. The best social management tools, such as Hootsuite, have image guidelines to ensure you’re always using the correct size specifications that will ensure your post looks great on any device. It’s all about making your assets pop to draw focus to your content. It goes without saying that the more eyes on your ad, the better the results! Just take a look at the stunning, creative imagery used by Modern Market to advertise their new presets. This is an ad that people will definitely take notice of. 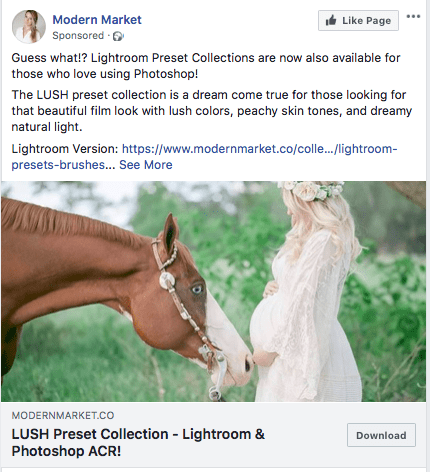 Once you’ve discovered the right imagery for your ad, Facebook has a number of formats to meet your promotional needs, no matter what your campaign goal is. For instance, if you want to showcase a certain product or line, you can use Carousel or Collection ads that allow you to utilize multiple product images. This format is perfect for beauty brand Estée Lauder to promote their new perfume, which also adds an extra element of engagement. Similarly, Facebook Offer ads allow you to highlight special offers or discounts, which can be an effective way of providing consumers with a purchase incentive. In addition, you can use Facebook Canvas for hi-res, statement visuals that follow “the bigger, the better” rule. Be sure to pick the option that best suits the needs of your campaign, and you’re guaranteed to see positive results. You may also want to continually switch up the style that you use, in order to keep your posts fresh and interesting. Got your visuals in place? Awesome, now it’s time to work on the words. 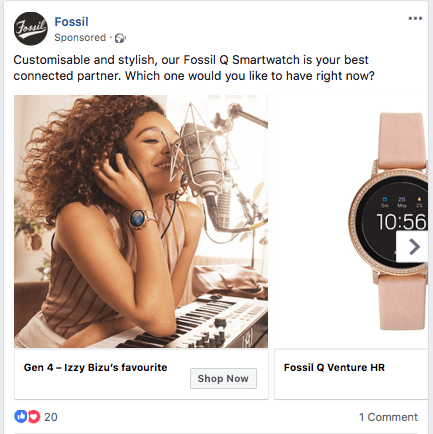 Pristine and precise copy is often the best way forward when it comes to Facebook ads; otherwise, there’s a risk that your audience might not stick around long enough to read it. The trick is to use witty and persuasive language without being overly sales-y. Also, don’t be afraid to utilize the power of storytelling. “Storytelling is the future of content marketing,” according to Smart Insights. Short, snappy sentences that are interesting, unusual, shocking, or emotional can really grip your audience and encourage them to continue engaging with your ad, as well as your brand as a whole. Just look at this example from streaming service, hayu. Their effective one-liner is immediately intriguing and pulls the reader in for more. Speaking of ad copy, you might want to include social proof as a way of convincing consumers to convert. After all, people always want what others have got. For instance, add customer testimonials or mention how many people are currently loving your product or service. Essentially, if your Facebook ad is aspirational and uses statistics to back up what you’re saying, you build trust with your audience. And you know what trust leads to? Those all-important clicks and conversions. Sometimes it’s not enough to just have pretty visuals and witty copy. Sometimes you need to give consumers a bigger reason to interact with your brand. The best way to do this is by offering a special offer or discount. After all, people are 57% more likely to make a purchase from a new brand if they have a coupon or feel like they’re getting a great deal or limited time offer. This way, even if the purchase isn’t quite what they’d hoped for, they feel reassured that they at least got it at a good price. 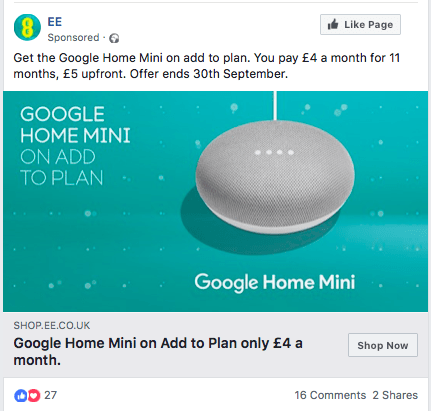 Just look at this special deal offered by the technology company, EE. If you really want to accelerate your conversions, and fast, you need to consider using a strong call-to-action at the end of your Facebook ad. This motivating action will encourage your audience to engage with your ad, either by liking and commenting on the post, or by clicking through to your website to find out more. Additionally, it helps if you use direct language like “Shop Now” or “Sign Up Here” to persuade your audience to act. After all, sometimes we all just need a little nudge in the right direction. Check out this example of a strong CTA from Fossil. 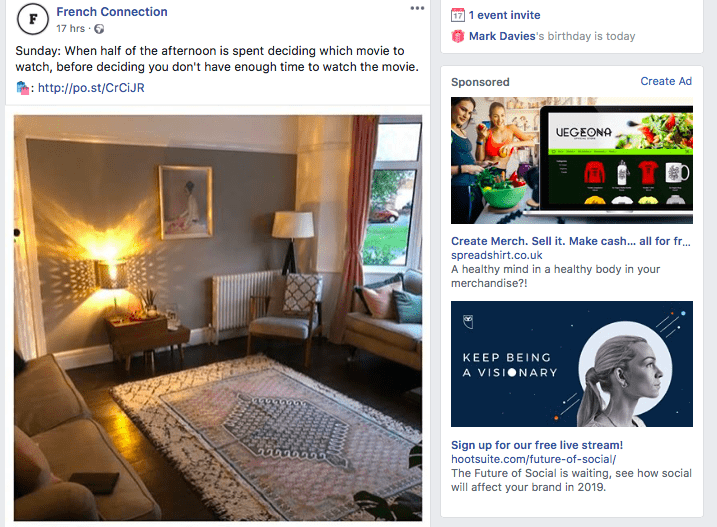 Here’s what not to do when it comes to Facebook advertising: never include a special deal and CTA button, and then link to a completely different section of the website or to an irrelevant product. 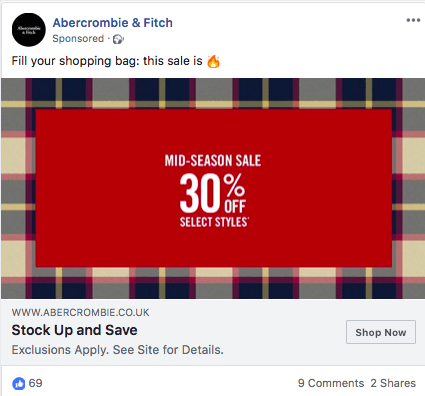 For example, Abercrombie & Fitch recently promoted a mid-season sale on Facebook with 30% off selected styles. However, when you click the “Shop Now” button, you’re taken to a New Arrivals section of their website, which features full-priced products. People then have to spend time searching for the relevant section, which might prove to be too much effort, particularly if they’re browsing Facebook through their smartphone and on-the-go. And you know what that means? Hello, website abandonment. Goodbye, potential customer. Beyond that, you should also be sure to use the same branding, color palette, and voice throughout all of your marketing materials; this keeps everything consistent and ensures a strong brand identity. Often, it’s less about how many people you’re targeting, but whether they’re the right kind of people. If you want to avoid spending money on advertising to people who are existing customers, then I have some good news for you: Facebook makes it possible to exclude people from seeing your ads who have already bought from you. You also have the option of personalizing your audience based on their gender, age, location, and interests. For instance, if you’re a fashion brand, there’s no point in advertising to thousands of people if only a small percentage are interested in fashion. Why? Well, you’re reducing the likelihood of conversions. Be savvy, narrow in on your likely audience, and then watch the sales roll in. As well as customizing your audience, you can also choose from different types of Facebook ad placements and platforms. For example, you can opt for “Automatic Placements,” where Facebook puts your ads where they’re likely to perform best. Alternatively, you can “Edit Placements” and make the decision yourself. According to Kissmetrics, there are only three major Facebook ad placements to consider: the desktop news feed, the desktop right column, and the mobile device. Here’s a look at the desktop right column. Beyond that, you have different platforms to choose from. You can sync your Instagram to improve your results by 30% to 40%, according to Social Media Examiner. 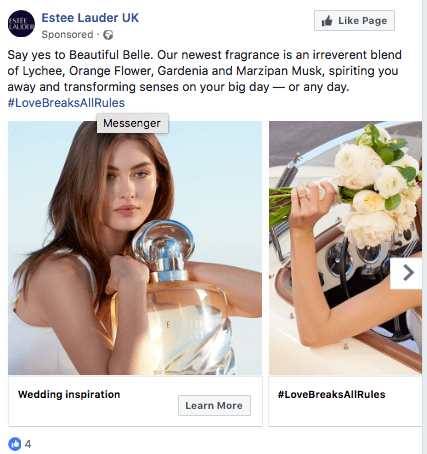 Messenger ads are also a useful way to increase website traffic. Either way, consider your campaign goals, and the choice is yours. If you’re struggling to make some of these significant decisions, I get it. There’s a lot to consider. The way that you can combat this fear is by experimenting with different options to see what works best for your brand. Use a little something called A/B testing and it will make your life a whole lot easier. A/B testing is where you try out two different ad variations and see which one performs the best. This could be in terms of visuals, format, copy, audience customization, placement, or just about anything else. Just be sure to only test one variable at a time so you know what is making the difference. As with anything in life, it’s important to go through the “trial and error” process and keep improving your Facebook ads until you get them right for your specific brand, campaign, and audience. At first glance, Facebook ads can seem insurmountable. However, it’s true that practice makes perfect. If you’re willing to spend time creating optimized ads that cater to your core audience, then it won’t be long before you generate increased interest, improve your click-through rate, and ultimately create a more positive ROI. Katie Davies is a freelance writer, blogger, and world traveler. She has written for a number of businesses and publications on her three favorite subjects of fashion, marketing, and travel. When she’s not producing content, she’s either shopping for clothes, exploring a new place, or sitting somewhere having a good cup of tea.